One with eager smile, one's expression sour. The pessimist looks back and groans, "Time goes by so fast!" The optimist looks back and grins, "More memories to last!" The pessimist recalls the debts, the dollars thrown away. The optimist recalls the gains, the values earned each day. The pessimist sees struggles fought, times that trouble crossed. The optimist sees each success and respects the cost. The pessimist looks back and sighs, "I should have not done that." The optimist: "How much I've learned..." And gives himself a pat. The pessimist says, "What a year! I've never known such woe." The optimist says, "What a year! ...Amazing how we grow." One with eyes so used to seeing problems every day. One with eyes so used to seeking out a better way. The optimist with hope and dreams, the pessimist with dread. 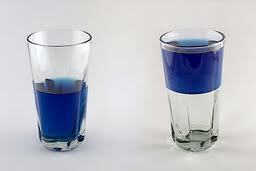 Your glass reflects the year ahead: Half empty or half full.